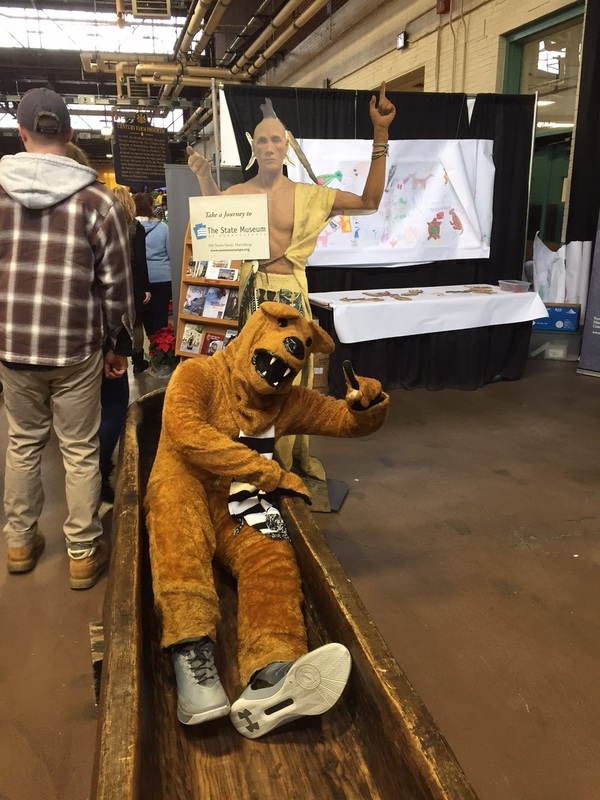 The staff of the Section of Archaeology at The State Museum of Pennsylvania just completed a very busy week at the 2017 Pennsylvania Farm Show. 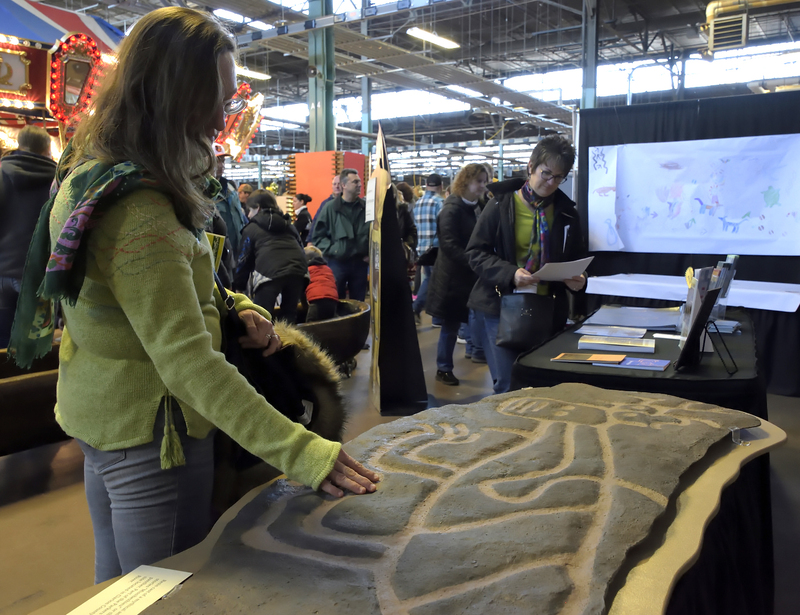 Our theme for this year’s exhibit was Pennsylvania Petroglyphs – a rare glimpse into the minds of ancient Native Americans. The exhibit represents a major investment of staff and volunteers, but there is no question that our presentation makes a difference in Pennsylvania archaeology. We continued to see excitement in the eyes of children and adults as they sat in the dugout or as they stood gazing at the banner illustrating the Little Indian Rock petroglyphs or rubbing their hands over the resin cast of the Parkers Landing Water Panther petroglyph. The dugout is still the place to take the annual family picture and thousands were taken. 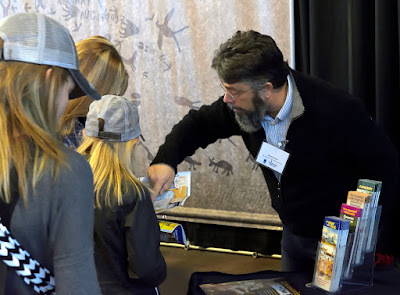 We spoke to over 30,000 visitors and distributed over 13,500 archaeology brochures and over 3600 temporary tattoos, free planetarium passes and magazines, including 750 copies of American Archaeology magazine, 1100 Archaeology Month posters and 670 back issues of Pennsylvania Heritage Magazine. These were especially important in promoting the Pennsylvania Historical and Museum Commission, the State Museum, and the Heritage Foundation. In addition, the Society for Pennsylvania Archaeology, Inc (SPA) had a table for distributing information on archaeology and accepting new memberships. Our principal goal at the Farm Show is to always share highlights of Pennsylvania archaeology with the citizens of the Commonwealth and encourage visitation to the State Museum where the learning experience continues about Pennsylvania’s archaeological past. We also strive to promote the preservation of archaeological sites in our state so that future generations can benefit from these valuable resources. The high volume of attendance is a testimony to the quality of the exhibit, the initiative of our volunteers in engaging the public and the public’s interest in archaeology. Pennsylvania has an outstanding wealth of archaeological resources that we believe can enhance the lives of all citizens. Our exhibit on the petroglyphs and the information that was disseminated is another step in communicating this heritage to the citizens of our Commonwealth. 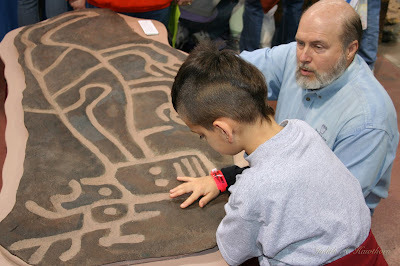 This year, visitors were fascinated with the mystery and meaning of the petroglyphs. As you know, the archaeological resources of Pennsylvania are being destroyed at an ever-increasing pace. We need help in slowing this destruction and the Farm Show exhibit is a significant vehicle for the dissemination of information and for increasing public awareness to the threats to archaeological resources. Our exhibit was well received and we are beginning to plan next year’s theme and reflect on how we can improve the presentation. For example, we are considering an exhibit featuring a Susquehannock longhouse. The theme has been suggested several times in the past and it would coincide with planned upgrades in our Indian village gallery - we are open to suggestions. Here we are again; it is January and The State Museum of Pennsylvania is setting up our annual exhibit at the Pennsylvania Farm Show. 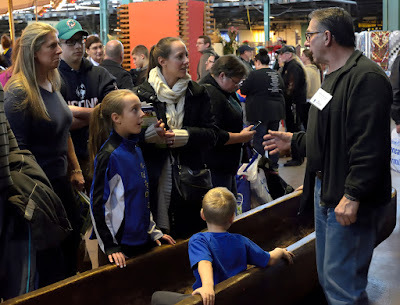 This is our biggest public outreach program of the year and, according to the Farm Show web site, it is the “largest indoor agricultural exposition in the nation, with nearly 6,000 animals, 10,000 competitive exhibits and 300 commercial exhibits.” Our goal is to engage the public in a discussion of the value of archaeology and to encourage visitation to the Hall of Anthropology and Archaeology at the State Museum. 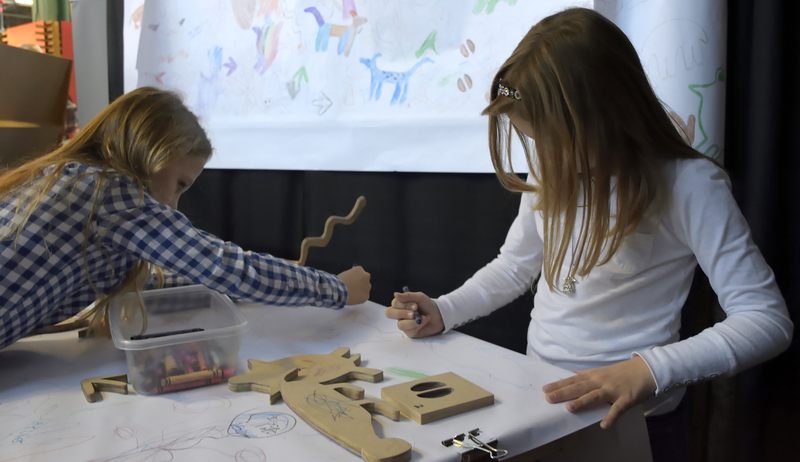 As in past years, the State Museum’s exhibit is set up in the Family Living section, located in the main exhibition hall of the Farm Show Agricultural Complex next to the MacClay Street Lobby across from the carousal. 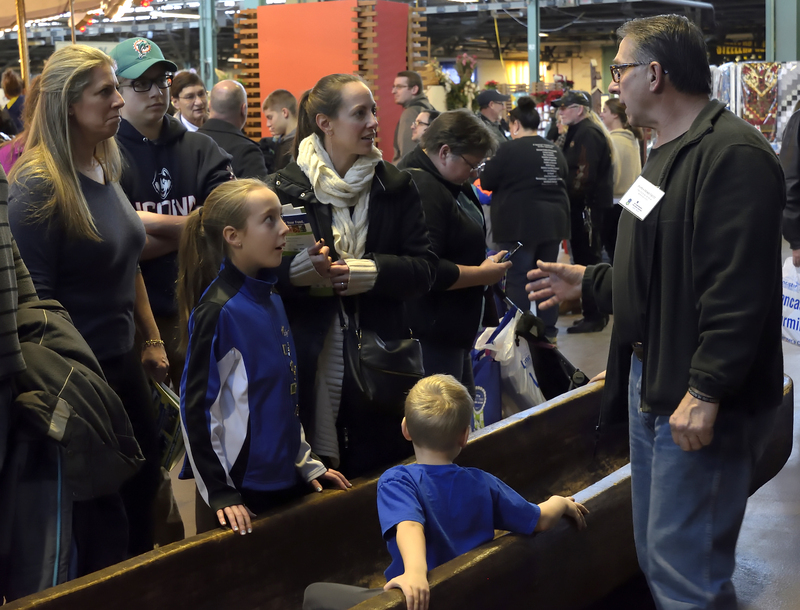 The 101st annual Pennsylvania Farm Show begins Saturday, January 7, 2017 and runs through Saturday, January 14. Our theme for this year’s exhibit is Pennsylvania Petroglyphs – a rare glimpse into the minds of ancient Native Americans. It features a life size, 20 X 9 foot, banner depicting the Little Indian Rock Petroglyphs and a resin cast of the Parkers Landing Petroglyph. We have a brochure on the Petroglyphs of Pennsylvania, including a map of Pennsylvania petroglyphs and a detailed reproduction of Little Indian Rock. This petroglyph is part of a group of seven rock islands, located just below the Safe Harbor Dam, 10 miles south of Columbia or 40 miles south of Harrisburg. The site contains approximately 300 petroglyphs and is one of the largest clusters of such carvings in the Eastern United States. The resin cast is named “Missibezhieu” (Mish ee pa zu) or, the underwater panther. This was a mythical creature found in Ojibwa stories. It is part of the Parkers Landing petroglyph site located on the Allegheny River in Clarion County. The other related handouts are a Heritage Magazine article about the making of the petroglyph banner and a connect the dots handout for children. Finally, we have a petroglyph rock art activity – Connecting with the Past - where young children can trace images from the Little Indian Rock Petroglyph thereby creating their own petroglyph. The banner is derived from a rubbing (http://twipa.blogspot.com/2009/03/schuylkill-county-petroglyph.html) by Paul Nevin of Little Indian Rock. It took Paul two days to transpose the designs onto several large pieces of paper. The rubbing was then digitized (http://www.phmc.state.pa.us/portal/communities/archaeology/native-american/little-indian-rock.html) by the Publications Division of the Pennsylvania Historical and Museum Commission (PHMC) under the direction of Ted Walke, former PHMC Publications Chief. Now that this petroglyph is in an electronic format, it will significantly facilitate the analysis of these designs by researchers. The exhibit is a cooperative endeavor by the Society for Pennsylvania Archaeology, Inc. (SPA), the Pennsylvania Archaeological Council (PAC), and The State Museum of Pennsylvania. Members of the SPA will be on hand offering information about the organization and answering questions. If you are interested in joining the SPA; new memberships include the biannual journal Pennsylvania Archaeologist, announcements of the annual SPA meeting, newsletters and a special Farm Show bonus of three previous issues of the journal will be included. So, stop on by and see what SPA is all about! Finally, don’t forget that our 20-foot-long replica dugout canoe is also featured in the exhibit. Everyone is welcome to stop and test it out by climbing in and imagining how it would have been to live thousands of years ago, when this was one of the main modes of transportation. While taking a “ride” in the canoe you can read our poster and look at the photos about how dugout canoes were made and how the State Museum’s archaeologists and volunteers made the exact canoe you are sitting in through traditional methods with traditional stone tools. While you are at it, get a picture of the family in the dugout. Visit our exhibit at the Farm Show; learn about Pennsylvania archaeology and have fun with the family.